Beginners mechanical pencils feature a bold, No. 2 lead that is hard to break and long-lasting. 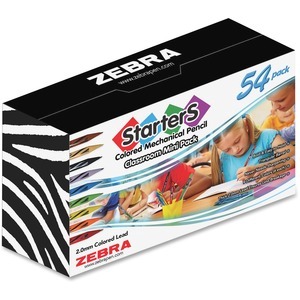 They are great for beginning writers and artists. Cadoozles Starters come in eight brilliant colors (Cherry Red, Shamrock Green, Lemonade Yellow, Blue Skies, Cotton Candy Pink, Lavender Purple, Orangey Orange and Licorice Black) so children can let their imagination run wild. Unique triangular barrel is easy to hold. These pencils never needs sharpening and are pre-sharpened. Lead is refillable.